The Office is back for its eighth season and Steve Carrell is long gone, but the rest of the gang from Scranton were doing all they could to make us forget that fact. They came close to succeeding with the much anticipated reveal of who would be filling those regional manager shoes, as well as James Spader's first episode as CEO, and a pair of new pregnancies to boot. Though there were hopes that this change in leadership would actually bring a revival to the series that had already gone past it's prime before losing its biggest star, that hasn't come to be just yet. “The List” was by no means a bad episode, but it also didn't renew any faith that The Office can return to its glory days. Personal preferences aside, it was a bit surprising to see Andy sitting in the big office and not out in the bullpen. His own equally shocked grin said it all, and was amusing enough to distract from the disbelief at the job not going to Darryl; who seemed like he had been being groomed for the spot since Jo hauled him out of the warehouse. Certainly preferable to Jim or Dwight, who have both proven on more than one occasion that their characters just don't work as manager. Helms also has the best chance of recapturing the charmingly annoying aspects of Michael Scott with his own energetic personality. Of course if he wants to keep that job he's going to have to work on getting the new head honcho to like him. He's mysterious, powerful, and manipulative; though not particularly funny, at least not in this episode. 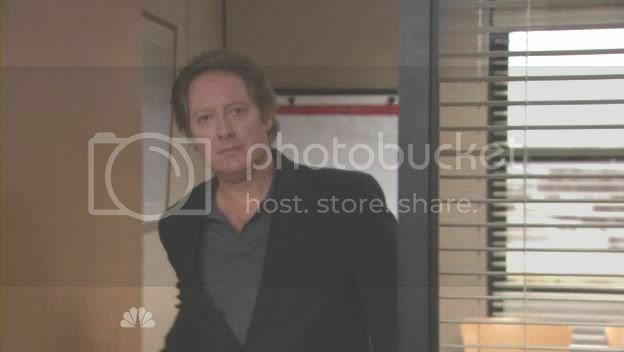 Robert California definitely seemed like the right choice for the job at the end of last season, when James Spader garnered more laughs with the character than any of the other potential candidates – even those that had no chance of actually joining the show. But with “The List,” the enigmatic man just wasn't producing the same amount of humor. It could be a matter of him only working as one-off character, but hopefully the issue is just him needing to be fleshed out. But the rather ridiculous way in which California climbed the corporate ladder also didn't help the situation. After setting up Jo's character as a woman who loves working more than the money she makes from it, and as someone with a fairly sharp eye for BS, having her give up her own job didn't play well. It would have been one thing for Kathy Bates to at least make an appearance to close out her character's run -one would hope she still might- but to leave the transition completely offscreen feels rather cheap. Just as California working out of Scranton for half of his week will also feel like a cop-out. If California can start bringing the funny, than all of this will become much easier to look past, but until then the character is going to seem shoehorned into a plot that's had a few too many conveniences already, even for a comedy. Just as with the two big changes, the rest of the episode was a mix of highs and lows; starting with the cold open. Continuing their now three year tradition of kicking off the season with bit pulled from the YouTube archives, some of the office's deep thinkers had taken to Planking. Worth a chuckle on its own, Dwight breaking up the “Plankers” pushed the physical comedy a bit too far, if only because most of the staff would be in need of medical attention afterward. Erin did squeeze a laugh out of the whole thing with an even more succinct description of the moronic activity than Oscar could provide; “Planking is one of those things where, hey, you either got it or you don't...And I don't.” As writer and director, B.J. Novak let things become a little too zany again when Dwight tried to lead the charge against the “right-siders.” There's nothing wrong with well-executed physical comedy, but when one character is assaulting others more than once an episode, it's time to reel it in. Especially for a show that was once meant to be a look at the everyday goings-on of a typical office. The episode did have some purely enjoyable moments, and though Kevin probably stole the show with his not-so-subtle tipoffs(“Warning! Warning!”), those workers Robert had written off as losers were scoring their own laughs as well. Angela wasn't packing any real-life baby weight, but that only meant she got to come up with great nicknames like “Little Pregs” for her petite self. You can probably guess what moniker Jenna Fischer's pregnancy earned for her character. 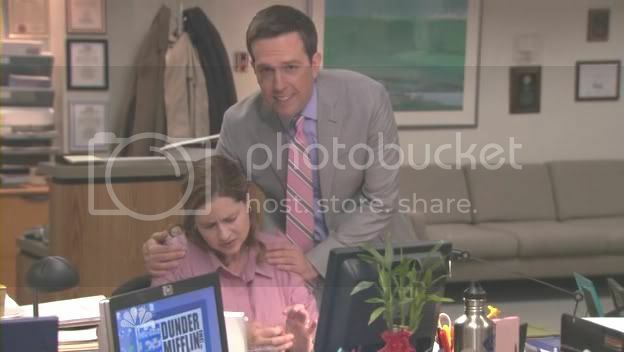 She may be feeling like nothing more than a fat mom, but with just one episode under its belt Pam's second pregnancy has already provided more enjoyable moments than her first. The hormones are still completely out of control, but at least this time they are pushing her into depression instead of the haughtiness that came with carrying Cece. If there are more scenes in store like watching her bawl uncontrollably over the dog in an insurance commercial, than this will be a welcome change to her regular character. Maybe The Office is worth sticking around for, even with all its flaws. 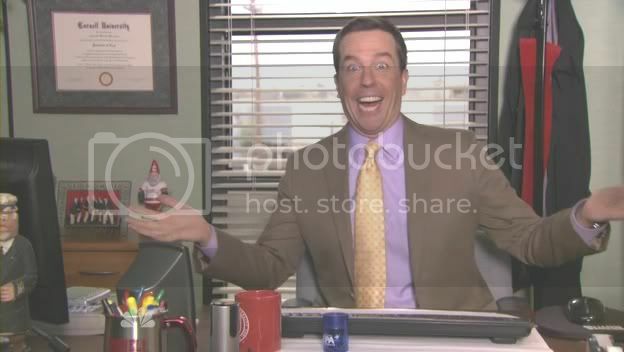 Andy proving he has what it takes to be the boss while also endearing himself to his fellow Scrantonites in a genuinely heartwarming final moment says the series can go on without Michael Scott. The positives of “The List” didn't quiet outweigh its negatives, but it also wasn't enough to write off the series completely.